A few weeks ago, I attended a Gala dinner with Desmond Tutu and people from Shared Interest (an organization that invested in South Africa’s new democracy after apartheid was dismantled). It was an inspiring evening. 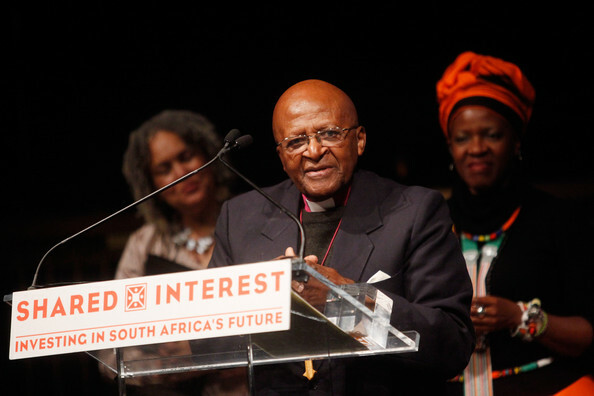 The man who introduced Tutu talked about his legacy–and he included climate activists in his list of people who have followed in the Archbishop’s footsteps. And then Tutu spoke. The man is filled with so much energy, spirit, passion, and love. It was humbling to hear him speak about his life, Mandela, apartheid. He started to tell stories about his experiences talking with the US and UK governments during apartheid–how he pleaded with with them to take action and help South Africans. Tutu recalled their intransigence and his frustration. Then, he started waving his hands excitedly in the air and telling how student-led divestment campaigns at campuses across the US finally started to put political pressure on governments. I always talk about past divestment campaigns. I’ve talked with apartheid activists. I’ve read the case studies. But Tutus words gave repeated phrases a whole new meaning. I began fully to appreciate the role that the fossil fuel divestment is playing in history. We are part of a powerful legacy–a legacy of justice, student power, and overcoming institutional resistance to action. We’re reviving divestment’s power to affect political will when all else has failed. We still believe that, at the core, politicians will listen to a movement. When I read about James Rebhorn’s passing, I thought of the movie he was in, ‘The scent of a woman’, and that Harvard’s motto is ‘Veritas’, and then Al Pacino says like to the leaders in the prestigious prep school that are trying to ruin the one student with integrity, ‘be careful what kind of leaders you’re producing here’! The success of divestiture with apartheid is a strong example, I honestly wouldn’t have though it could make a difference in climate change if it weren’t for that strong historical example of overcoming against all odds. Seems like the power of the movement could grow exponentially if just one or two of the top schools do the right thing.